Ready to move-in 1 bedroom apartment with amazing sea view! Fully furnished apartment now on a bargain price! Balchik Bay apartment – area’s best bargain! Fully furnished 1-bedroom apartment with amazing sea view. 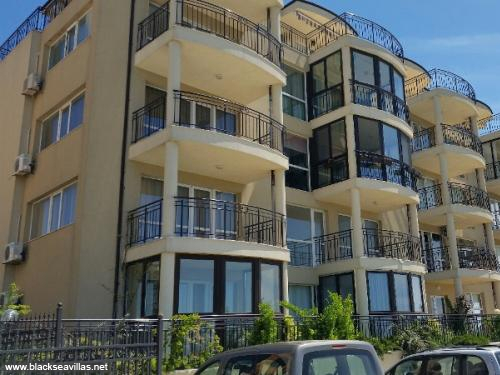 This fabulous one bedroom apartment is part of Balchik Bay complex, located in the heart of Balchik. Positioned on a hill the complex offers amazing sea view! Enjoy your stay in Balchik watching the sunsets and sunrises, the arriving and departing yachts from the yacht port and the bay, taking a swim in the swimming pool, walking down to the sea. This charming apartment is sold completely furnished with double bed and wardrobe in the bedroom, equipped kitchen, living room with sofa and table with chairs. Bathroom is fully fitted. A nice terrace with glazed windows reveals spectacular sea view! The living area of the flat is 52,08 m2 and the total area including communal parts - 58,81 m2. It is located on third floor of the building. Lift available. Living in Bulgaria has many benefits. Life here becomes even more easy going and less stressful with the lower prices. Bulgaria has Europe’s lowest personal and corporate taxes. Apart from this you can shop cheaper here or even buy some delicious homemade cheese, yoghurt, fruits and vegetables from the locals for pennies. Balchik town is one of the most famous resorts on the North Black Sea coast. After a day at the beach you can enjoy a nice walk along the sea followed by a romantic dinner with sea view panorama. In a distance on 20 km you can find 3 international golf courses. For those who love the game the courses offer many modern facilities on amazing prices. Balchik is also a great choice if you are a seeker of nice places with ancient history. You can visit The Royal Palace, the Botanical garden, Museum of History, Kaliakra cape and many other places worth being. All in all a great location property, ready to move in straight away. Distanced only 50 km away from Varna city and international airport. Highly recommended and carefully selected by us.